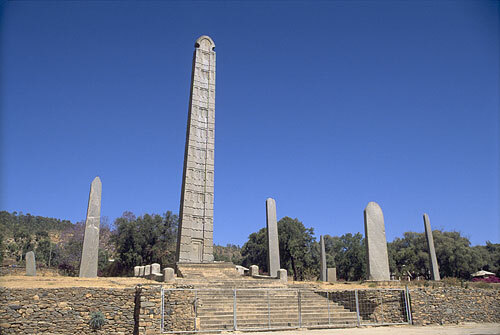 Axum is home to a granite obelisks garden with each one weighing at least 50 tonnes and standing at 24 metres at the least. It has archaeological sites which hold Ethiopia’s history, including its claim of direct linkage to Israel’s King Solomon through Queen of Sheba and the son they had together, Menelik I. Many became aware of the name Axum, following the widely publicized story in April 2005 of one of its obelisks being returned from Italy 68 years after it was looted from the country. Following this event, Axum has in recent times somewhat earned its bragging rights with its gigantic obelisks and many other historic edifices. It is one of Ethiopia’s most visited historical cities. Ethiopia’s history is synonymous with the kingdom of Axum whose origin is traced to the middle of the 2nd century BC. Around the 4th and 7th centuries AD, the Axumite Kingdom controlled most of what is Ethiopia today, including territories in the southern parts of the Arabian Peninsula. The city was a haven for Greek traders and had the same links with India, Arabia, Rome, Egypt and Persia. Away from this fame, many who visit the historic city are lured to it by its many archaeological sites and magnificent granite obelisks known also as Stelae. Ranging from 33 to 24 meters high, their granite structures are as old as 2, 000 years and more recent ones about 1, 000 years with each one weighing at least 50 tonnes. Just as they towered above our reporter and other tourists present in all their magnificence, initially silent thoughts became spoken as some said, ‘no wonder it was stolen’ by El Ducce Mussoloni during Italy’s invasion of Ethiopia. The 24-metre (80ft) high stone, which is seen as an important national symbol in Ethiopia, was taken on October 28, 1937, on the orders of Mussolini. The piece was returned in bits which were then coupled and mounted. Designs on the obelisks represent architecture of typical Axumite palaces which were four to five stories with wooden horizontal beams, similar to architecture in Lalibela where Axumites moved to after the collapse of the kingdom. Architectural differences in both locations include the fact that the Lalibela churches were carved from top to bottom and had hollows for habitation, while axumite obelisks were carved bottom to top and didn’t have any hollows, but have false doors and blind windows. Very much like some Nigerian traditions, Axumites buried their royalty with their slaves and belongings because they believed in life after death. A lot of these belongings considered treasures and artefacts were found during excavations which are preserved in the archaeological museum in Axum. First of all, seeing so many uncoordinatedly carved stones, scattered all over the place as the eyes of our reporter saw them, did not in any way seem like they served any purpose. But for the Ethiopians, they are symbolic the same way in Nigeria tomb stones and bustier are over graves. The stelaes are royal tombs or memorials. Beneath the obelisk garden are 13 concrete chambers supposedly used by royalty, four of which have been excavated and nine sealed by concrete awaiting excavation. The Queen of Sheba is another central part of Ethiopian history situated in Axum. For Christians, her visit to King Solomon is an all too familiar story. Ethiopians generally believe that this visit was the genesis of a relationship between the two which resulted in a son, Menelik. This is Ethiopia’s claim of having direct links with the Solomonic Dynasty founded in Axum. The tour guide narrated that Ethiopian legend believes that while she visited him, he made her promise not to take anything from his house. At night she woke up thirsty and drank some of the water King Solomon had kept near her room. It is believed that the king was awoken by the noise and came out to find her drinking the water and accused her of breaking her oath not to take anything from his house. Solomon was attracted by her beauty and consummated his relationship with her, resulting in the birth of a son named Ibn-al-Malik (known as Menelik), the founder of Ethiopian Solomonic Dynasty. When Menelik was about 21 years old, he inquired about his father from his mother and she told him that it was King Solomon of Israel. He embarked on a visit to Jerusalem to visit him and was received with great honor. Menelik stayed with his father learning the Law of Moses for three years. Menelik looked very like his father, which the Israelites found confusing and demanded the king sent him back home. King Solomon agreed on the condition that the high priests would send their eldest son and 1, 000 people from each tribe of Israel with Menelik. This they agreed to. Menelik then returned to Axum in the company of Azariah the son of the high priest, Zadok, of the temple of Jerusalem. Before the journey Azariah told Menelik of a dream asking him to take the Ark of the Covenant with him to Ethiopia and told him he had done so, replacing the original with a copy. This angered Menelik but Azariah convinced him to take the Ark with them. Zadok discovered what happened and reported it to King Solomon who ordered a pursuit of Menelik. Whilst this was going on, Solomon dreamed that his son should have the Ark. He returned to Jerusalem and ordered his high priests to keep the incident secret. Upon his return to Ethiopia, Menelik founded the ‘Solomonic Dynasty’ and the Axumite kingdom where Judaism and the Law of Moses were adopted. His lineage ruled Ethiopia in an unbroken line with Haile Selassie being the last of the emperors, until the revolution of 1974 which ended the Ethiopian monarchy. Ethiopia’s Orthodox Tewahedo faith is tied to the Ark of the Covenant which is considered its most reserved holy relic. According to the tour guide – no church is a church until there is an Ark of the Covenant present. It is believed that the original Ark of the Covenant still exists and rests in a monastery in Axum in the premises of Saint Mary of Zion church making it the holiest of sanctuaries in Ethiopia. The first Saint Mary of Zion church was built in the 4th century during the reign of King Ezana who converted the Axumite kingdom to Christianity. An Ark of the Covenant, known as the tabot/the tablet, is kept in the holy of holies (Maqdas) in every church to indicate that the church has been duly consecrated. The original Ark of the Covenant is now supposedly kept in a small chapel built in 1965 on the orders of Emperor Haile Selassie. One chosen monk is in charge of its care and preservation. He is also the official guardian of the Ark and no one, except him, is allowed to enter the chapel. Before his death, according to Axumite tradition, he must nominate a successor. Axum is Ethiopia’s most important center of Orthodox faith and boasts of many sites of historical significance, including the palace and bath of Queen of Sheba, the tombs of King Ezana and King Gebre Meskel, the monastic complex of Saint Mary of Zion, the chapel which houses the Ark of the Covenant and the city’s antiquities museum. It was the capital where the coronations of emperors and empresses took place until the reign of Emperor Haile Selassie.